A father is 3 times as old as his son. After 12 years, his age will be twice as that of his son then. Find their present ages. Hence, the present age of father is 36 years and the present age of son Is 12 years. Ten years later. A will be twice as old as B and five years ago, A was three times as old as B. What are the present ages of A and B. Let the present age of x years and the present age of B be y years. Hence, the present age of A is 50 years and the present age if b is 20 years. A is elder to B by 2 years. A’s father F is twice as old as A and B is twice as old as his sister S. If the age of the father and sister differ by 40 years, find the age of A. Let the present ages of A, B, F and S be x, y, z and t years respectively. The ages of F and S is differing by 40 years. Thus we have z – t = 40. Hence, the age of A is 26 years. Six year hence a man’s age will be three times age of his son and three years ago he was nine times as old as his son. Find their present ages. Let the present age of the man be x years and the present age of his son be y years. Hence, the present age of the man is 30 years and the present age of son is 6 years. Ten years ago, a father was 12 times as old as his son and 10 years hence, he will be twice as old as his son will be then. Find their present ages. Let the present age of father be x years and the present age of his son be y years. Hence, the present age of father is 34 years and the present age of the son is 12 years. The present age of father is 3 years more than three times of the age of the son. Three years hence, father’s age will be 10 years more than twice the age of the son. Determine their present age. After 3 years, father’s age will be (x + 3) years and son’s age will be (y + 3) years. 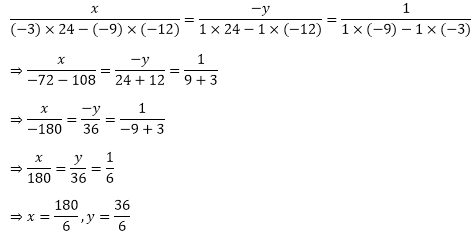 x — 2y - 13 = 0 So. A father is 3 times as old as his son. In 12 years’ time, he will be twice as old as his son. Find the present ages of son and father. After 12 years, father’s age will be (x + 12) years and son’s age will be (y + 12) years. Hence, the present age of the father is 36 years old and the present age of son is 12 years. Father’s age is three times the sum of age of his 2 children. After 5 years his age will be twice the sum of ages of two children. Find the age of father. Let the present age of father be x years and the present ages of his two children’s be y and z years. 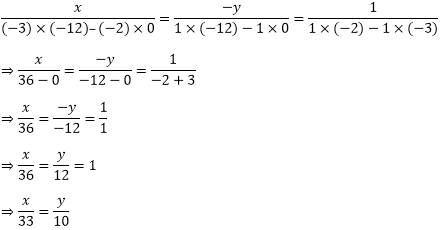 Here x, y and z are unknowns. We have to find the value of x. Hence, the present age of father is 45 years. Two years ago, a father was 5 times as old as his son. Two years later his age will be 8 more than 3 times the age of the son. Find the present ages of father and son. Hence, the present age of father is 42 years and the present age of son is 10 years. Five years ago, Nuri was thrice as old as Sonu. Ten years later, Nuri will be twice as old as Sonu. How old are Nuri and Sonu? Let the present age of Nuri be x years and the present age of Sonu be y years. Before 5 years, the age of Nuri was (x – 5) years and the age of Sonu was (y- 5) years. The ages of two friends Ani and biju differ by 3 years. Ani’s father Dharam is twice as old as Ani and Biju as twice as old as his sister Cathy. The ages of Cathy and Dharam differ by 30 years. Find the ages of Ani and Biju. Let the present ages of Ani, Biju, Dharam and Cathy be x, y, z and t years respectively. Here x, y, z and t are unknowns. We have to find the value of x and y. Hence, the age of Ani is 19 years and the age of Biju is 16 years. 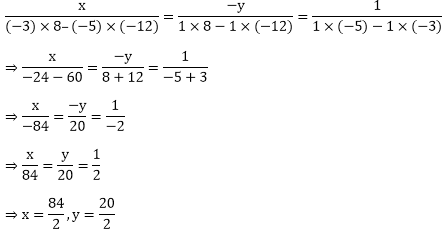 (ii) By using the third equation, the first equation becomes x= 2t -3. Hence, the age of Anil is 21 years and the age of Biju is 24 years. Note that there are two possibilities.